Lohengrin is one of my favourite Wagner operas, but it seems to be surprisingly difficult to pull off on stage. Productions tend to be overly traditional (James Levine with Peter Hofmann) or somewhat strange (Richard Jones with Jonas Kaufmann), and it is no wonder that some conductors choose to perform this opera in concert. 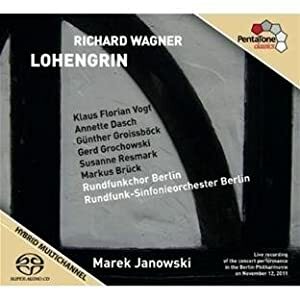 PentaTone Classics has released a whole series of Marek Janowski’s concert performances of Wagner operas, and the latest is a 2011 Lohengrin starring Klaus Florian Vogt, Annette Dasch, Susanne Resmark, Gerd Grochowski, and Gunther Groissbock. Klaus Florian Vogt is known for his light, Mozartean tenor, and while he has sung Parsifal successfully, may initially seem too light for Lohengrin. However, he does manage to sing out in the important moments, and the softer sections in the opera rarely sound this beautiful. His diction is excellent, and it’s nice to hear someone in the role who doesn’t struggle for high notes or pianissimo passages. Especially beautiful is his “In Fernem Land”, which is expressive and very moving. Annette Dasch as Elsa sounds lovely and slightly bland in the lovely and slightly bland role of Elsa. She does her best to make Elsa interesting, and she clearly makes an effort to show how the character develops throughout the opera. She starts out the opera quietly and somewhat tentatively, but as the performance progresses her voice blooms. She is particularly exciting in her two big scenes with Ortrud, especially her fiery showdown in the cathedral. By far the most exciting performance was Susanne Resmark as Ortrud. While she is obviously straining and her vibrato is wide, her “Entweihte Gotter” is thrilling and her scene with Telramund is a lot of fun. Gerd Grochowski doesn’t have the most beautiful voice, but he sings intelligently and sounds suitably manipulative. In most recordings, Ortrud overshadows Telramund who ends up seeming like a coward, but this recording shows how well-matched they are in intelligence and cunning. Gunther Groissbock sounds great as Henry, and made the most of his role. Marek Janowski likes to conduct quickly to keep the action going, and is highly skilled in making tempo changes sound totally natural. The Rundfunk-Sinfonieorchester Berlin follows him very well, and the playing is impeccable and clear. The orchestral sound, particularly the string section, is not as rich as it usually is, but I didn’t mind that at all. The Rundfunk Chor was outstanding, and shows the importance of the chorus in this opera. Overall, a highly worthwhile recording and with its excellent sound, would be an excellent introduction to the opera. I was at Mr Vogt’s Metropolitan Opera debut as Lohengrin several seasons ago (opposite Karita Mattila — a superb pairing). While his voice may sound light and lyric, he sings with such excellent focus and technique that he filled the Met with voice without the slightest hint of strain.